On my tastings to date, the hype surrounding the greatness of the Bordeaux 2009 vintage appears entirely justified. Buy, buy, buy, I say. Which is of course great news for all except for your bank balance. 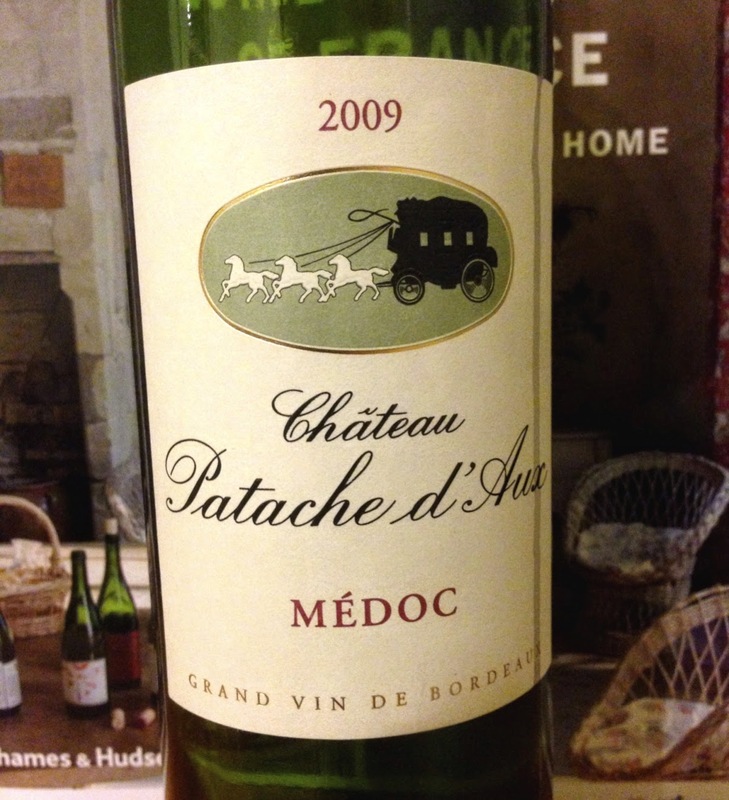 Chateau Patache d’Aux, a cru bourgeois from the Médoc appellation to the north of the left bank in Bordeaux, has produced a very good wine here in the 2009 vintage. It is deeply coloured and classically profiled. Its aromatics remind of blackcurrant and cedar. Its palate is a reasonably firm expression of cabernet sauvignon, with fine grained tannins emerging with time in the glass. Were this wine tasted blind, I suspect it would be mistakable for a lesser cru classé. I think that the Bordelais are at last realising that they cannot rely on their 'appellation' to sell their wines as they used to and the better vignerons are pushing the quality of their wines higher as a result.Interesting isn't it…I don't mind the AOC system because it is regional/ terroir based but 'Bordeaux' is rather extreme in that it based on a complex AOC system which then overlaid with another complex system of 'classifications'. This system both intimidates consumers (especially those who are new to Bordeaux wines) and is in fact irrelevant as to quality almost as soon as the 'rules' are written down on paper. Whilst this system protects vested interests it also has had the tendency to drag quality down to the lowest common denominator and/ or encourage lazy winemaking rather than promote excellence. This has ultimately not been good for Bordeaux.In fact, only the other day I read an article on a tasting of mid to lower-priced Bordeaux that stated that price (with prices 'gridlocked' by the aforesaid AOC/ 'classification' system) is not really a good indicator of quality. Indeed, it went on to say that if you buy a more expensive bottle thinking you are getting a better wine, the statistical probability of your hope coming true is a meagre 14%!Let's hope that the new breed of vignerons from Bordeaux who realise that making wine is all about doing the best by their terroir and commentators such as yourself can improve this statistic! I certainly agree with these thoughts. The Bordeaux classification system has its limits as you mention. The self-perpetuation of high pricing for those lucky enough to be on the inside also seems to be a result of the gridlock. I quite like the notion of appellation systems, except of course that its guarantee of typicity seems rather worn and frayed at the edges and so I tend to encourage people towards following conscientious producers particularly in Bordeaux. To that end, it is very encouraging to see more vignerons who are putting in the effort in the vineyard and the winery in Bordeaux. Hopefully they get the recognition due to them. Personally, being always more interested in the wine than the label, these are exactly the wines that are of great interest.